We bought our first house back in May of this year - a ca. 1900 farm house perched on a rocky ridge overlooking railroad tracks surrounded by woods on a little under an acre. Slowly, we have been peeling back the layers of this little house to reveal its roots. It was hard to imagine it was built in 1900 with the '80s turquoise carpet, the wood paneled walls and paneled ceilings. Even before we moved in the carpet in the living room went ASAP only to reveal some vintage 1950s (approx.) linoleum tiles. Not bad. They were better than the nasty carpet. Well, the cold weather started warping the tiles and they were popping off. 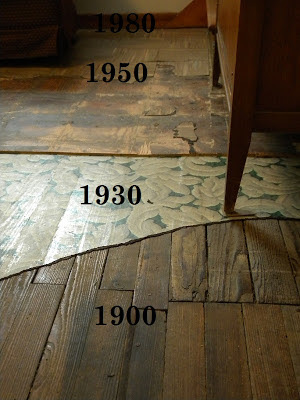 I'd always wondered if the original wood floor of the house was intact beneath the carpet, tiles, and sub-flooring. So, I ripped off a chunk of the sub-flooring to reveal - the original floorboards! Have you ever noticed that different feeling you get when you walk into an historical home or old school house? Your footsteps echo on the floorboards with a satisfying "plunk plunk" and your nostrils fill with that dusty, woody, smoky smell. You take a deep breath and you know you're smelling history? That's exactly what it feels like for me on that small square of exposed original floor boards. Just that small spot of floor changes the entire feel of the house. Like the true soul of the house is finally there for everyone to see. It's amazing the relief it gives me. I knew it was there, waiting to be discovered.